March 28, 2014 | Welcome to Little Gull Marina! Welcome to spring….maybe?!! The snow just keeps coming. As you can see we still have lots of the white stuff. Rain today will take some but the forecast says we will see below 0 temps at night for a while to come. The ice is 3 feet thick so boat launching may be a little delayed if this keeps up. Snowmobile trails are still open but are no longer being groomed so please be careful if you are still out playing as winter winds down. Please keep an eye on the Buckhorn Snowmobile Club website for updates. Now to the important stuff…The little fellow in the pic, Arcade, is the newest addition to our meet and greet committee. Stormy has a partner in crime now to assist him in making sure everyone is able to display affection as they arrive. 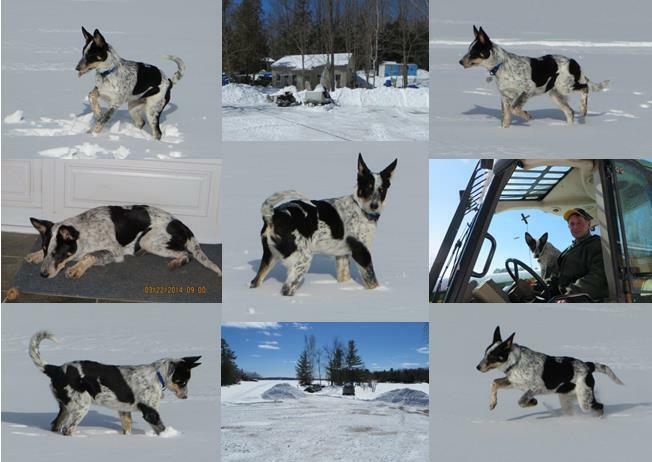 He is a 4 month old Border Collie/Australian Heeler cross from the west end of the province. He’s full of energy and keeps telling us how excited he is to meet everyone this spring/summer! As usual in the spring we require 2 weeks’ notice to prepare the boats for delivery back to your dock. So, let Sally know well ahead and if you send an email and it hasn’t been answered within 48 hours it means she didn’t get it which means you won’t get your boat so please follow up with her! Our hours for April are 9-4 Mon.-Sat. closed Sundays. As of March 31st we will no longer be an MNR fishing and hunting license issuer. If you need a license for fishing this summer please pick one up at a local issuer in your area or you can go online to the Ministry of Natural Resources Ontario website and get one. Have a great weekend and we look forward to seeing many of you in the coming month!